Women have been in the midst of another revolution. We’re working harder, speaking up, rising to the social and political opposition to our rights. Women everywhere are identifying as feminists, but it seems each woman has a different definition of what being a feminist means. In this post, CampaignHER Gaba Gotay speaks of her own internal struggles standing as a feminist and how she defines her feminist voice. The vindication of the rights of woman is a global enterprise. From the 18th century pen of Mary Wollstonecraft to the rally of the suffragettes and before, every time a woman made a choice based on the basic rights she knew she had as a human being. The feminist movement is both a source of pride and of great frustrations. Because if the powerful tide that swept across American and the world in the sixties and seventies was not strong enough to open minds, change hearts and move the needle of the law in the ethical direction, what difference would I make with my shallow ripples? In my thirty-four years, I have not attended any social or political march. I have not stuck my neck out for a greater cause. I have never been an activist in support or defense of any of the rights I take for granted. What does that make me? I think it makes me privileged. I think it makes me complacent. Some radical factions might say it makes me an accomplice, domesticated, subjugated. I think it makes me very much a stereotype of my generation, or how we used to be perceived. Apathy is the cross I bear. But for how much longer would I have that luxury? I was never part of any team in sports or academia. I pride myself in my individuality and my objectivity. I always found valid points on both sides of the coin. I remain neutral and diplomatic, an undisputed libra. Yet, I do remember a time when I did pick sides. I do remember a time when I saw injustice around me and spoke out in disgust. I was a child then, eight or nine, just about to reach the crest of my childhood wave. As I came down I crashed under the pressure of society, the patriarchy, the gaze of boys, or rather, their lack of attention. I became invisible. I understood the other girls were competition. It was survival of the fittest or the prettiest. In a match-making-procreating world, sisterhood became an impossibility. As a little girl and adolescent, I felt the epitome of femininity. From how I ran, to the way I dressed, my sensible heart and my flair for drama. Femininity oozed from my personality. I was almost pathologically reserved around new people and situations, and around those who posed a threat to my emotional core. I could not stand dirt, sand, sweat. Though I could appreciate the freedom they painted in my sister's face; running around, being assertive, taking a stand for every issue as if it were life or death. I stopped standing. I sat down. I hid, and I found comfort in a passive dream; prince charming. I loved the clicking sound of women's heels on shiny floors, in the office building where my mother worked, shoulder pad to shoulder pad with the men around her. I felt my feminine ambitions made me leaser. The strongest woman I knew seemed to believe my whole future would remain dwarfed by my sensitive soul and my feminine qualities. What did she mean when she said it? I see what is there to be had, what each side of the woman coin prices and prioritizes. I want something of each, but not exactly. I want my version of it all. I appreciate the foundations she set in place. Knowing I can dare dream for more and say those words with conviction because she told me I could, and I believed her. But I'll do it my way. Isn't that what she wanted for me? I have the right to define just what all means. I fought the good battle against my female insecurities for years. I retrieved back my assertive voice, my inner self, and I discovered all the other aspects of myself who were not feminine at all, and I felt intensely proud of them. I realized I am a whole person, and that a whole person is both, feminine and masculine. I realized other women are not my competition. I could only truly compete with my own old limiting beliefs. As always, the confusion comes when we want to settle desperately on a single definition. The problem comes when we think there can only be one kind of feminist as if there was only one kind of woman. Being a feminist is being a humanist. It's being in favor of basic rights that do not belong to only one half of the human race. Being against discrimination based on anatomy, on responsibilities and functions designed by patriarchal tradition instead of on facts. Being a feminist means supporting and embracing the rise of women in society for the benefit of all its members. I choose to respect other women's choices. I acknowledge that my definition of wanting it all can and will be different from the woman standing beside me (shoulder pads optional.) I respect the commitment to the greater cause and ask my individual contribution and journey to be respected. Will I ever be ready to stand on the picket line? Will I ever be part of the movement? Will I have to? Maybe the time is getting nearer where the choice will be made for me. Can I be a feminist and still wear no buttons, wear no hats? Can I be a feminist by the single, private act of asserting myself, reclaiming my body and cultivating my mind? Can I be a feminist from behind the strength of the words I write? Loving and caring for my husband, wanting to be married in the first place? Unashamed of my desire to become a mother? Can I be a feminist and flaunt proudly the feminine and masculine aspects of my mind and my character? 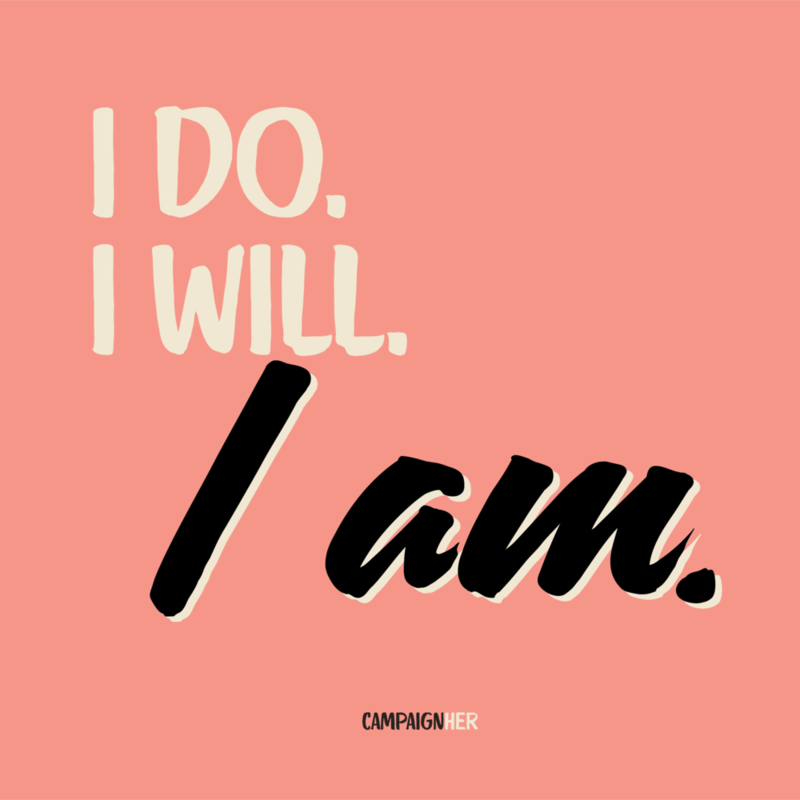 I do, I will, I am.